Stella Berg, herbalist and textile maker, has been spinning and dyeing yarns and making textiles for fifty years. She will talk about wild collection, cultivation and preparation of dye plants and the basics of how dyeing is done with British yarns (nettles, hemp, linen, wool). 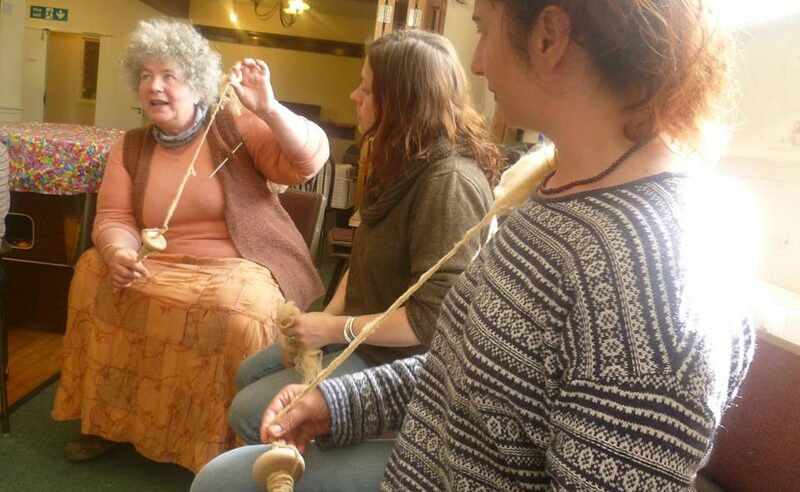 Stella will take students through the age old patterns of carding and spinning, with spindles and on the wheel, learning to produce a strong yarn that can be knitted or woven. As we are relearning the skills of preparing textiles, one of the most absorbing aspects of this is dyeing. Dye materials abound everywhere, from goat willow bark to elderberries.It is fascinating, alchemical, transforming natural fabric into subtle, glowing colour, quite unlike the chemical dyes we are accustomed to now. Stella will talk about the basic rules of dyeing, dyestuffs, mordants and you can dye some yarn. There will be handouts but it is recommended to take your own notes also. Stella will also be giving a talk on Textile Sovereignty: Why the Industrial Revolution began with textiles and the politics of de-skilling clothing traditions. From prehistoric times, almost as much as with food, a large proportion of everyone’s time was taken up with growing, preparing and weaving textiles, we can’t survive without them, and it’s no accident that the Industrial Revolution began with cloth. It’s even now of huge political importance, and we need to look at making textiles as much as growing food. A talk to explore the political ramifications of textile sovereignty.